Is the Starling Bank personal loan any good? Challenger banks are already stealing the spotlight in both the savings and current account market with better rates than their high street peers and clever mobile budgeting tools. 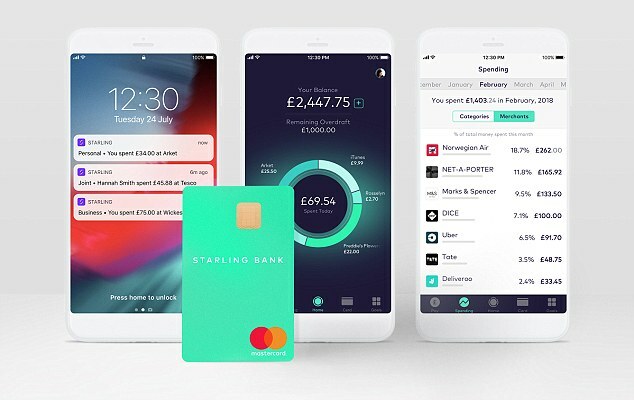 Starling is a prime example, already boasting the cheapest current account for overseas spending, and recently releasing a new eye-catching ‘vertical’ bank card and joint account feature. The bank has now turned its hand to personal loans, launching with a tool that lets you borrow up to £5,000 or spread the cost of purchases you have already made. The cost-spreading feature picks out any purchases over a £500 minimum in your Starling current account and offers you the option of spreading payment periodically through your Starling personal loan repayments. It will offer personal loans between 11 and 15 per cent APR with repayment terms of one, two and three years. There are no set-up fees or penalties for paying it off early. You must already have a current account with the bank to apply for its loan, which is done through the Starling smartphone app. The app is the only way customers can manage their current accounts and loans, but it has the advantage of beefed up budgeting features and a real-time view of your accounts. Loans work with your existing overdraft, which means Starling will reduce your overdraft limit by the same amount as your personal loan, until you repay it. That also means you will have to have an overdraft approved before you can get one, and you will need to apply for the borrowing facility with a large enough limit to cover the loan amount you require. The bank will only soft search your credit history when you apply for an account, if you then apply for an overdraft feature it does a hard search on your file, which can affect your credit profile. According to a spokesman for the bank you can apply for multiple smaller loans within your overall overdraft limit and not be credit checked each time. Loan rates start at 11 per cent APR and will never exceed 15 per cent, based on your credit score. How competitive they are will depend on how much you borrow. For example, the best deal This is Money found on a £5,000 loan was Hitachi Personal Finance, charging 3.5 per cent. Over a two-year loan monthly repayments would be £216.01 and the interest over the whole two year period would be £184.33. On the same loan from Starling at 11 per cent, monthly repayments would be £233.04 and the overall cost £592.94. At £3,000 to £4,999 the cheapest rate is offered by Zopa at 5 per cent, the cost creeps up to 6.9 per cent on a £2,000 loan with Zopa and at £1,000 its 9 per cent. Below £1,000 Starling’s rate is likely better than you will get elsewhere as you won’t find many high street lenders offering amounts below this threshold. But if you really do only need to borrow £500 you are likely far better off using an interest-free credit card to do so so long as you can repay the full amount within the interest-free period. If on the other hand, you’re regularly dipping into your Starling overdraft, which charges interest at 15 per cent EAR and you want the ease of using one account then switching part of this borrowing to a personal loan on a lower rate would save you some money. Being able to apply for a loan instantly through your bank account is very convenient, but the most important aspect for most borrowers is the interest rate. Unfortunately Starling’s rates are a lot higher than you can find elsewhere, particularly on larger amounts – and as the examples above show, the costs stack up pretty quickly. The Spread the Cost feature is an interesting idea, and again convenient if for example you realise that a costly purchase will put you in the red and you won’t be able to pay it back in the short-run. But it in some ways prompting you to take a personal loan in your transaction history is encouraging you to borrow which shouldn’t be a choice made lightly. And while its loans are flexible with no hidden fees to leave, it is a formal loan that will charge you interest for the full term which could encourage you to take longer to repay than you would otherwise. Interest on its overdrafts may be slightly higher at 15 per cent, but this is only charged when you are in the red.